A precision weed spraying system can reduce herbicide use by 50 per cent and deliver large savings whilst still controlling weeds. Reductions in herbicide runoff will contribute to improved water quality draining into the Great Barrier Reef lagoon. Managing runoff of agricultural herbicides into the waterways entering the Great Barrier Reef environment is one of the many issues Queensland farmers are addressing. In tree plantation crops such as macadamias, herbicides are used to control weeds along the tree line. 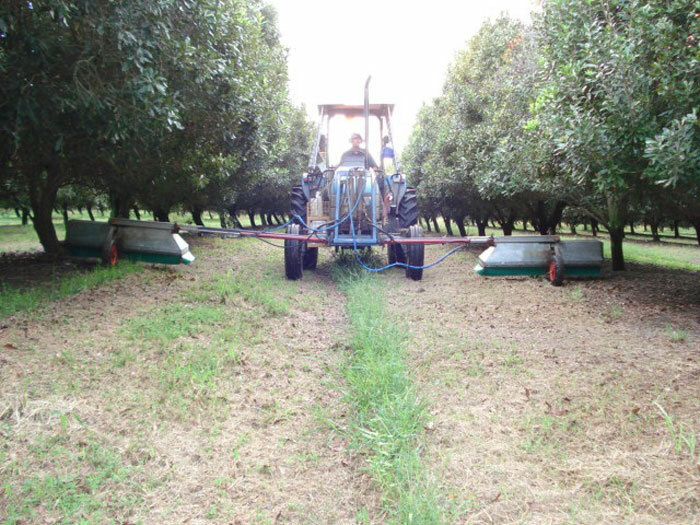 Management of weeds on the tree floor, the area immediately beneath the tree canopy, is critical for efficient mechanical harvesting in macadamia farming. Conventionally, the tree floor is kept weed free by applying herbicides uniformly across this area a number of times a year. Previous studies have shown that precision application (e.g. band spraying) of herbicides is effective in reducing the amount of spray coverage and subsequent transporting of herbicide in runoff. Through the Reef Rescue program, the Burnett Mary Regional Group assisted a macadamia farm management company near Bundaberg to purchase a WeedSeeker to control weeds and reduce herbicide runoff from the group of farms it manages. demonstrate that the modified herbicide applicator is economical for horticulture growers. Previous herbicide practice: conventional continuous spray rig. Photographer: Rob Doyle, Growcom, Bundaberg. Improved herbicide practice: band spray rig. Photorapher: Rob Doyle, Growcom, Bundaberg. 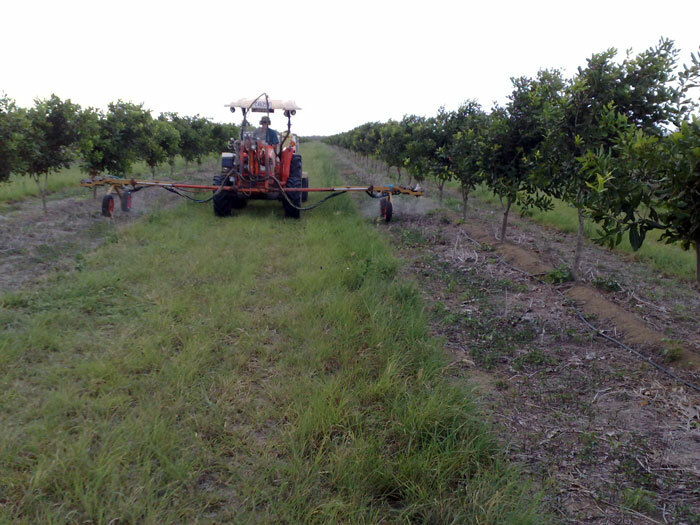 The project commenced in 2010 and focussed on a group of macadamia farms near Bundaberg, totalling about 700 hectares. It involved the upgrade of a macadamia producer’s existing conventional spray rig to WeedSeeker sensors which selectively apply herbicide when weeds are detected. Weed coverage can be sparse at times and a continuous herbicide application, as used in conventional methods, could be unnecessary. When fitted to the spray boom, the WeedSeeker’s chlorophyll sensing ‘eyes’ effectively control each individual spray jet so that they come on only when the sensor detects a weed. The targeted weed applicator (band sprayer) results in substantially lower herbicide applications leading to better environmental outcomes. The band spraying system reduced herbicide use by 50 per cent in the first year. This in turn could have a significant impact on the amount of herbicide in runoff leaving the farm. In addition, the investment delivered large cost savings in herbicide use, labour and fuel, while maintaining weed control. The system cost just over $22,000 to buy and install with savings in herbicide costs alone expected to amount to $26,000 per year. With estimated savings on labour and fuel costs, the total savings are expected to be in excess of $40,000 per year. A further positive outcome of band spraying is the environmental benefit associated with reduced herbicide applications. A 50 per cent reduction in herbicide application is expected to result in approximately a 50 per cent reduction in herbicide runoff losses, based on published studies of the effect of reduced herbicide applications (Masters et al. 2008, 2012; Silburn et al. 2011). Masters B, Rohde K, Gurner N, Higham W, Drewry J (2008). Sediment, nutrient and herbicide run-off from cane farming practices in the Mackay Whitsunday region: a field based rainfall simulation study of management practices. Queensland Department of Natural Resources and Water for the Mackay Whitsunday Natural Resource Management Group, Mackay, Queensland 4740. Masters B, Rohde K, Gurner N, Reid D (2012). Reducing the risk of herbicide runoff in sugarcane through controlled traffic and early-banded application. Agric. Ecosys. Environ., Special Issue: Catchments and coral reef. Silburn DM, Foley JL, deVoil RC (2011). Managing runoff of herbicides under rainfall and furrow irrigation with wheel traffic and banded spraying. Agric. Ecosys. Environ.